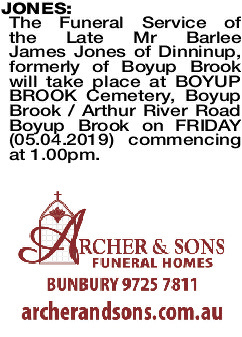 The Funeral Service of the Late Mr Barlee James Jones of Dinninup, formerly of Boyup Brook will take place at BOYUP BROOK Cemetery, Boyup Brook / Arthur River Road Boyup Brook on FRIDAY (05.04.2019) commencing at 1.00pm. Our deepest sympathy to the Jones family on your sad loss. President, Councillors and Staff of the Shire of Boyup Brook.